Band 5's so close to being done in this picture, and since it was taken last Friday, is now complete. Considering how wide the band is, it went very quickly. I hope the next one, equally as wide, goes as well. This is going well and is an easy stitch, since it's all basketweave. I'm now well over halfway done! I think it's looking cute. After this picture was taken, I completed part three, totally, except for the beads. Yay! The red roses had to be finished and there was a bunch of backstitching to do. But it's done. This means the thing is now well over halfway done. None of the three parts left is as big as any of the three completed. I feel like I'm finally getting somewhere on this. The roses I did this week that you can see in the picture are an algerian eye variation that took me a little bit to get the hang of, but I think they look good. I got a second color of blue and the blue variegated border done this week on the third corner. With each color done, I feel -so- much closer to completing the whole of part five. Still a lot of gold to put in, and the light colors, but it's getting there. You can tell there's a lot more progress when I work something more often. This has really accelerated since I started working on it daily. Not only is the flag growing, so is her dress. Using another shreddy metallic, I put chain stitches in the top squiggles and then outlined more of them around the guitar. This week, I'll be filling them in too. I thought, with this being a small project, that it would go faster than it is. I think it's because I get no joy slogging through the instructions. I know one of you said that's the price of designing genius, but my response to that is - editors. We didn't have our meeting this week due to bad weather, but I did get band one done anyway. I like the colors on it, and I think the variegated silk adds a nice touch to the carnations. The second band is all in cream and I'm about a quarter done with it already. Earlier this week, Pierrette gave me a Make My Day. I'm really really honored to get it. This blog was for my own benefit, after all, to show myself I was making progress when I felt I was mired in stitching doldrums. It seems others like seeing my progress too, and for that I thank all of you who take the time to read this. The Rules:Give the award to 10 people whose blogs bring you happiness and inspiration and make you feel happy about blogland. Let them know by posting a comment on their blog so they can pass it on. Beware you may get the award several times. Now comes my dilemma. I don't read other peoples' blogs often. I do browse occasionally, but I know if I do it often, I get so distracted by that that I don't do anything else. It took me a while to come up with my ten blogs that I didn't think have been Dayed. I do read Sharon B's blog and I look at Pierrette's at least twice a month, but they get inundated with these things! So, for something different, here's a list of blogs I visit. Oh, and to share the love ... not all are stitching related. Wind from the East - a Japanese blog about crazy quilting. She does wonderful work. GSGuide.net - My other main hobby is playing an online game. I've been playing it for some twelve years now. This is a fellow-player's help guide and information archive for the game. Blissful Creations - Bliss talks about life and cross stitch. Lani's Journal - Lani's a good friend and talks about her life as a musician in the Army, her family, and her stitching. Stitchery Nook - She has some beautiful pieces she's working on. Rooted in Mississippi - Rissa's got some "pretty impressive stuff" and she's not afraid to show it. She does some awesome work. Gigi's Blog - Gigi is a great cross stitch designer and is always doing something new and different. Go visit, even if you don't speak French. Isabelle Vautier's blog - She always has something going, and the pictures are beautiful. Athena's Thimble - a website dedicated to the neeedlework of members of the East Kingdom of the Society for Creative Anachronism. CJ Stitching and Blooms - Judy does some beautiful work in both beading and crazy quilting. This week, I was -one- jessica from finishing this when I realized I was -one- thread off two thirds of the way around ago. After muttering several curses to the stitching gods and frogging all the way back to the offending jessica, I decided I had enough of this particular area and spent three hours straight completing the oval. Don't you hate when you're off and it's a symmetrical design and would be noticed for placing everything else? I still need to put the big stitches inside and fill in the jessicas, but I think getting that whole outline done is something to be proud of, especially since it's made with really slippery rayon. I participated in the Valentine's exchange on Vikki Clayton's forums this year. My post office messed up, though, and kept this buried in their packages section for two weeks, so I -just- got it yesterday. Isn't it beautiful? Tracy from Kentucky made it for me. I have it hanging on my warping board for now until I find a more permanent spot for it. I think it's gorgeous! The second garden piece is done. I think it'll look really good with the special stitches in it. Now on to the third part. I like that I'm making progress on this, and I think the second one went a -lot- faster than the first. Onward, ho! Most of the work for this band is now done. It will be finished week after next. The next band is fairly wide, too, but I don't know how quickly it will get done. I like the colors on this and my husband loves the way it looks, so he'll have a good time framing it. The background looks a lot better in person than in this picture, bu the way. It's not all grayed out. Added blue and more orange to the picture. I'm just over halfway done, and I think the seahorse looks cute. I don't know what I'll do with it. I owe two more stitched pieces to a friend to make purses for her daughters. This might be good for that. Yay! I got a second color done on the third corner AND started the fourth. I feel like I'm making progress and will be finished with the third corner hopefully just after the end of the month. More blue and more white on the flag. It's, as of today, my daily project. It'll definitely be going faster now. I hope to get it done before I go on my trip, but I don't know. It's a -lot- of work. Yesterday, I looked at this piece and thought, "I can finish it tomorrow if I work on it exclusively." So I did just that, and instead of finishing it today, I finished it last night. We were going to put the years (they've been married 50 in April), but when we put it up in the mats, there just wasn't room for them below the names. I hope the in-laws like this. It's not my best stitching because well - I wasn't emotionally engaged in the project. Nothing new to learn, nothing exciting to do in it. The ribbon floss in the background of the music bars kept shredding as I used it. Even with very short lengths of about twelve inches, a full third of it shredded. Not my favorite floss. More whipped outline stitch with the swirls. I'll be filling them in during this week. For some reason, I thought this would go faster. I'm also still not at all pleased with the directions. Outside of the inner satin stitches, I have the first band of this piece done. Hopefully I'll be starting band two before we meet on Wednesday to work on this. I like the color choices I've made so far and hope they keep looking good for the rest. When I got this block to add to, I was intimidated by the beautiful work of the previous person. She did such a lovely rose bouquet and her seam treatments were excellent. So was her butterfly. So I decided to embellish the doily. Figured that was a safe thing to do. You can see close ups of the areas I worked on in the next few photos. After I did the doily, I put a little flower next to it. The larger flower is spiderweb, and the second one is just straight stitches in a circle. They look pretty good, I think. Since there was so much lace on the other side of the block, I decided to balance it out with some more on the lower left. I crocheted the edging with some thread I had around with sparkly in it, then added the two daisies. In this picture you really see the nice work done by Jill. What I did is barely visible. 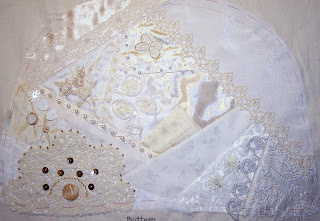 I added beads and bullion roses to the lace in the upper left and some sequins to the seam by the doily. I know the next person will do some wonderful things with this. I'm now three-quarters done with the little jessicas on this band. I'm glad this isn't my only project. Stitching all those circles crosses your eyes after a while! It's coming alone well since I started it back in the rotation. The lettering's done, except for the names and dates on the bottom. And I'd guess the lower knot is at least halfway done now. I'm getting there. My hope is to have this done by next weekend. The second "garden" is almost done! Actually, it is done, since this picture was taken last Friday. You can see that I've started in pretty heavily on the third corner, and that there's really not much left to fill in. Despite all the partial stitches, the silks are a joy to work with. I'm finally feeling like I'm making real progress again, even if the group as a whole is on to the sixth or seventh part. The new color, a teal, was added this week. I'm using it for the tie bars and insides of the swirls. This band is now over the halfway mark; maybe I'll complete it in the next couple of weeks. I still can't believe how quickly it's going. I've decided that I always need a small item in my rotation, and this was shunted aside last year after I got home from France. It's back in the loop now as my small project. Stitching on it's easy and it's working up quickly. Maybe I'll get it done in a month or so. This week I finished the darkest blue solid color on the third corner of this section. The end -is- in sight! I also added more gold, and after having worked some with other metallics such as Anchor and Ribbon Floss lately, I really appreciate Petite Treasure Braid more and more. It doesn't unravel or get too knotted and kinked, and it untwists easily when it does get kinked. I rarely have to worry about it. After working with these others, treasure braid is my "go to" metallic. Still progressing this and getting somewhat more substantial. It's fairly easy to stitch and I like the way it's coming together. All the blank spaces I'm leaving get filled with beads, and since I stitch on Q-snaps, I keep the beads for last and put them on in hand so they don't get damaged. The buckle's coming along. Lots and lots of wrapped backstitch. I've not gotten any more comfortable with the instructions, despite being on the second page of four. Some things you have to hunt for because they're a line or two away from everything else and in small print. I made some progress this week - the flower is there. The diagonal part of the step is an odd stitch that she's having us use. It looks almost like a boxed half stitch. Not quite sure why we're using it. I'll have more done next week. I have to! I've got to go to the meeting on the twentieth with at least the first band done. this week. Jill already started embellishing it, and I need to do more. I'll be working on it today and see what I come up with. Melissa's decided she's making it into a tea cozy. This week I added Cobblefield Road back to my rotation. I get to do little circles with really slippery thread again! Actually, it looks really good, so I'm pleased. Since taking this picture, I've got half the jessica stitches done on this band. I've not dared to count how many there are. It's amazing how much more I get done on a piece when it's the one I'm working on daily. This one is it. As you can see, I have the whole top braid done and most of the words done on this. By next week's picture, I'll be well into the second braid. Looks like I might have it done ahead of time. I -think- I'll finish this band in the next couple of weeks. Unlike band four, it has more negative space and less stitching. This means, although it's really wide, it's not as much stitching. The colors are coming along like I hoped, and I like the way the overall piece is coming together. I'm over halfway on this section! This time, I did filling in with greens and black, not much blue. It's still got quite a bit to go, but the light is there at the end. I also started the third section of the garden with the leftover ends from the colors used on the second. Since I'm using all silks in this, the threads feel soooo good. I'm getting so close on having the cross stitches done on part three. The gold is much more stitched now, and the plants all have their leaves and stems. All that's left is completing the pots and the scrollwork. Maybe I'll do it this week. Like most Chatelaines, this one's fussy about where you put the stitches and there aren't a lot of blocks of color. That's what makes it so lovely to look at, though! I'll be happy when part three is done. The gold is around the corner now and working on the bottom edge. I'll be starting on the small corner this week and hopefully getting more of the bottom side done. The work goes fast when I work on it and I'm still in love with this piece after nearly two years of working on it. The column for the blue part of the flag got bigger this week. It's one of the harder areas to stitch because it's not just big blocks of the same color. This week I'll be working more on the flag and hopefully the progress will be visible. This is the first of a series of twelve belt buckles from Chaparral in Houston. They reminded me of home and I was homesick. I have four of them now and started this one, as it's the first in the series. I really loved the look of them. The stitch guides and the line drawings - I'm not a big fan. The guides are in a hard to read for long periods font, disorganized, and have very little in the way of guidance - not even a picture of the whole thing pointing to the parts they're talking about. I'll get the series done, but in a lot of ways, it'll be in spite of the stitch guide instead of because of it. As you can see, the canvas line drawings are just - pudgy. It looks like they outlined the various pieces and gave a very wiiiide margin for them. This is my first time doing a series like this, so I don't know if it's me or the guides. Maybe they'll get better as I progress. I hope so. Decided that this wasn't much stitching, so when it came up in the rotation today, I just finished it. It'll be going out in the mail tomorrow. The piece was really easy and wasn't nearly as weird as some of the ones in this round robin I've stitched. It looks, though, like this group is going to disband before the end - three of the twelve people have pulled out. I -hope- I get my Lizzie Kate piece. I'm beginning to think that I just can't do round robins in English and cross stitch and expect to get them worked all the way through. On Wednesday, I started stitching the 17th Century English Sampler by Ilse Altherr. It's one of EGA's group correspondence courses, and I'm doing it with a group from my local chapter - Pocono Mountain. We're meeting monthly and stitching it together. I had to leave early to pick my son up from work, so I didn't get much done. On the other hand, it's now on my rotation ... so it will get some work this week. As usual, I changed up lots of colors. After posting the lack of progress on this block this morning, I spent most of the afternoon and evening embellishing it. I hope the person I made these embellishments for likes it. The fan is a combination of free embroidery, goldwork, and beading. The seam treatments are pretty easy, but after all the work on the fan, I didn't want to glitz -everything- out. Three more people work on it before it gets back to its owner. In fact, I'll be popping it in the mail to Europe in the morning. The next one for me to work on, a tea cosy, came in the mail yesterday. The quilt block mainly languished this week. 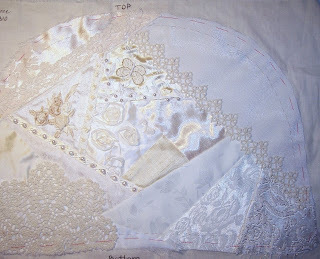 I did add a goldwork fan outline and am working on it this weekend, hoping to finish it. When I've got it done, I'll be posting. This is the last cross stitch round robin piece currently in my possession. It's a series of little fairies. They're small and this one should go really quickly. I know there are a few I still haven't stitched on, but I don't know where they are, so ... when they show up, I'll do them. I'm hoping to have this one out the door within the next couple of weeks.